For general enquiries, please contact COPE.Diversity@oecd.org. Our economies and societies have become more diverse than ever before, yet progress to ensure that all groups in society are given the same opportunities has lagged behind. This has led to erosion of trust in governments and institutions, reinforced social barriers between groups and at times contributed to intolerance and discrimination. Governments, businesses and citizens urgently need to take action to ensure that vulnerable groups who suffer disproportionally from inequalities do not get left behind. This requires a concerted effort to reap the advantages diversity can bring to our societies. An introduction to the debate on “The diversity challenge” by Jennifer Brown, CEO of Jennifer Brown Consulting and author of the best-seller Inclusion: Diversity, the New Workplace and the Will to Change. 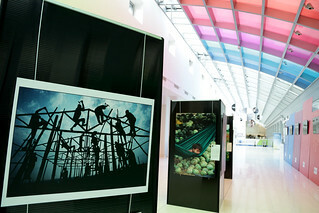 An interactive presentation by Reza of his photo exhibition “One World One Tribe” featured at the OECD Conference Centre. An interactive presentation by Anilore Banon of VITAE, a sculpture containing a million handprints that will be sent to the moon. A lunch prepared by the refugee cooks “Les cuistots migrateurs” served in the conference room to every participant. The video projection of “Women and Men” (52’) by Frédérique Bedos during the lunch break. Nearly 500 people participated in this event co-organized by the OECD Centre for Opportunity and Equality and the Club XXIe Siècle, from government, the private sector, academia, civil society, international organisations and the media. The high quality of the speeches and discussions provided many concrete examples of policies and strategies that help promote diversity in the workplace and society at large.